Jacob's Well, NJ > What sort of sorrow for sin? What sort of sorrow for sin? The Corinthian church was profoundly spiritually gifted and yet profoundly dysfunctional. When Titus delivered 1 Corinthians to them and they read Paul’s rebuke, Paul later rejoiced that they were not moved to worldly sorrow but godly sorrow (2 Corinthians 7:10). 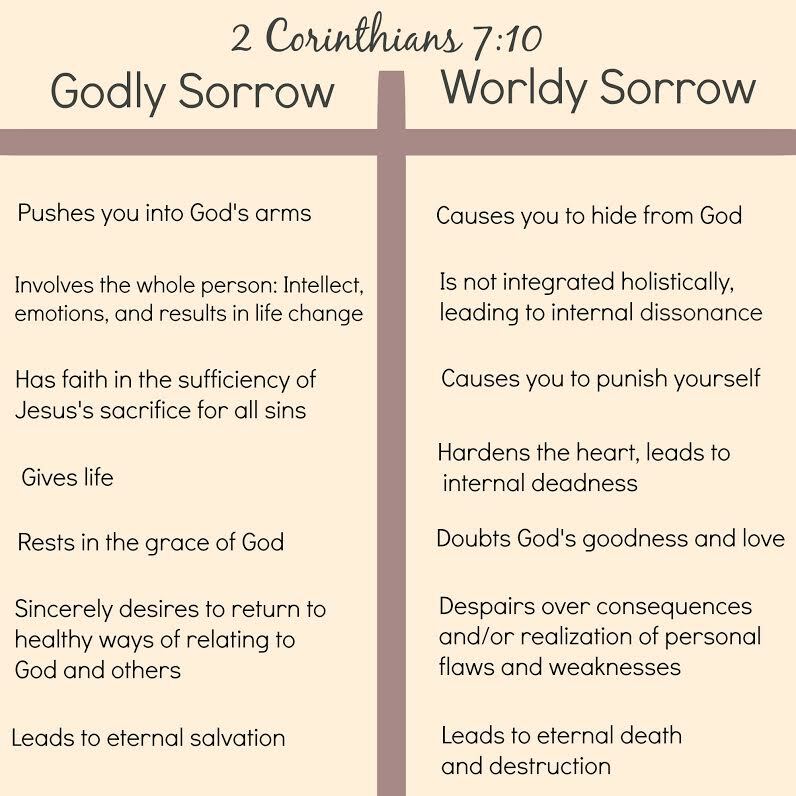 What are some of the differences between worldly sorrow and godly sorrow? The first and major difference we see is that the former produces death, while the latter leads to life and eternal salvation. Worldly sorrow sees it’s sin just like godly sorrow does, but is not rooted in the gospel and the grace of God, therefore it causes the person to hide from God in fear. Worldly sorrow may despise its sin just like godly sorrow, but causes the person to punish themselves or try to fix themselves apart from God’s gentle care. Worldly sorrow may lead to outward behavioral modification, but unlike godly sorrow, behind the behavior change is a belief that the person can earn God’s favor, a desire to conceal inner brokenness from others, or simply pride about doing the right thing and behaving in right ways. Worldly sorrow will only ultimately lead to bitterness, a crushed spirit, an increasingly dead heart and finally eternal death and destruction because it is rooted in unbelief in Jesus. Godly sorrow knows God’s goodness and grace and faithfulness to cleanse us with the blood of Jesus when we confess our sins (1 John 1:9). Godly sorrow sets us free from people pleasing shame, guilt and perfectionism and allows us to see our sin as God sees it, and run to Him for forgiveness knowing that He is our loving Father. Not only does Godly sorrow allow us to see our sin as God sees it, it allows us to see ourselves as God sees us: as His beloved adopted children (Romans 8:15). Because Godly sorrow is rooted in grace, it allows repentance to be holistically integrated without destroying us like worldly sorrow would. It involves a full hearted emotional reaction to our sin, an honest personal evaluation of sin and behavior, and flows out into radical life change with the help of the Holy Spirit. Godly sorrow deepens our heart’s sensitivity and tenderness. It transforms and strengthens our relationships. It makes us hungry and thirsty for that which truly satisfies: God. Because it is rooted in belief in the gospel, Godly sorrow leads to life and eternal salvation.